Whether you are planning an intimate dinner with friends or a wedding reception for 250 guests, Maya Catering Inc. is here to help. We have been providing the the Tristate area with delicious food for many years. No project is too small or too big for our executive chefs, and we are happy to create any dish for your special occasion. Maya Catering Inc. is owned and operated Mohit S Naik whose passion resides in creating beautiful and delicious meals. We will deliver the most exquisite meals for you and your guests, from appetizers to desserts. 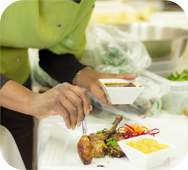 Our esteemed clients are always pleasantly surprised by how fresh and original our food creations are. Maya Catering Inc. uses only the freshest ingredients cooked to perfection according to your preferences or the theme of your event. When you trust Maya Catering Inc. to cater your special occasion, you are putting your trust in the hands of dedicated, passionate individuals whose goal is your entire satisfaction. We will gladly take the time to sit with you and plan a menu that suits your desires � and those of your guests. We will ask questions until we are satisfied that the menu suits your needs and takes into account the needs of your guests, such as food allergies and taste preference. And for those of you who know nothing about food but have special tastes, we will create a menu that we know you'll like. We have catered countless events such as wedding receptions,sangeet,rehearsal dinners, baby and bridal showers,corporate events,picnics, sweet sixteen, birthdays to name a few. We are fast, efficient, dependable and we will make sure that your special day is made better with delicious and attractive food. When you are in need of a professional and highly praised catering service, please do not hesitate to contact Maya Catering Inc. today. We will gladly schedule an appointment for you to meet our menu planner and design the perfect food for your perfect day.